Format: Monthly comic strip anthology; all strips reprinted US Marvel material, but there were brand new Night Raven text stories. Comments: First released in November 1980, Savage Action reprinted stories from Marvel US's magazines, slightly more adult fare than appeared in the US comics or UK weeklies. The only non-reprint story was Night Raven, last seen in July 1979's Hulk Comic #20, who now returned in illustrated text strips, appearing in many, but not all, issues. Since the US magazines rarely featured ongoing strips, Savage Action's strips similarly changed from issue to issue, but finally they began to stablise with the comic, not magazine, adventures of Moon Knight began Savage Action #8, soon joined by Ka-Zar's adventures from Ka-Zar the Savage. 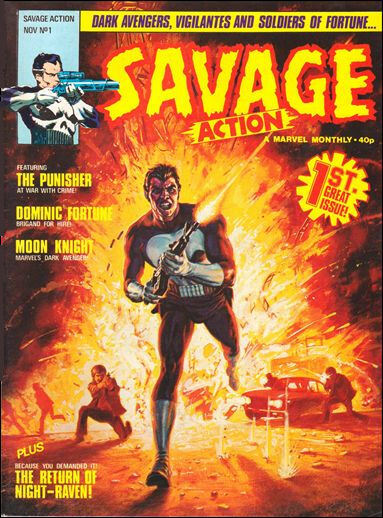 Savage Action was cancelled with #15 in January 1982; a month later it merged into Marvel Superheroes #382, which added an "incorporating Savage Action" subtitle for a single issue. The only Savage Action story to make the transition to the new title was Night Raven.